In a mystical land, far away from here, two prestigious martial arts tournament have been held since the ancient times: the White Lotus Tournament and the Black Lotus Tournament. These two tournaments are the most important show of legendary martial arts used by powerful athletes. Extraordinary masters are always looking for new talented athletes that will be forged into the ideal of the Perfect Warrior by exhausting training and life experiences that will fortify body, mind and soul. "Dojo Kun" means "Dojo Rules" and is a set of principles that guide the physical and spiritual development of the martial art practitioners. 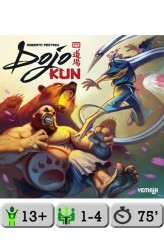 Dojo Kun is a game in which each player heads one of the four dojo (Tiger, Crane, Bear, Cobra). The main goal is to train your athletes and attract new ones, buy ..